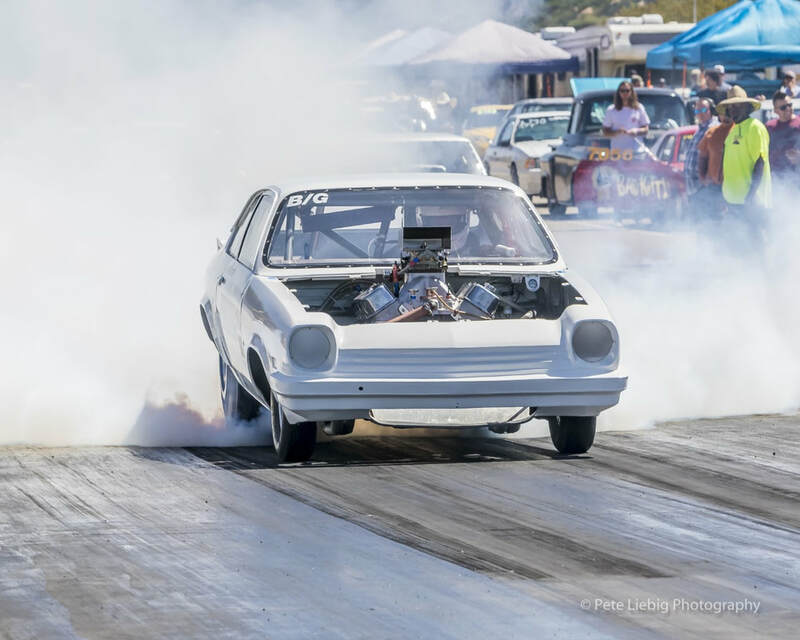 The 2018 Racing season got off to a hot start at Barona 1/8th Mile Dragstrip down in Lakeside, California when the Renegade series returned for the 2019 season. The Renegade series is ran in it's usual two categories, the Electronics and Non-E, both due for some competitive racing. The Renegade Electronics went first, with dozens of racers getting whittled down to just two. Gary Harfield would take on Daniel Munoz in his 71 Vega. Gary came looking for the win, getting a short head start over Daniel, but when the lights dropped, Gary left a little too early; a -.012 red light would give Daniel the Renegade Electronics win before he even had to step on the gas. Gary Harfield (Near) against Daniel Munoz (Far) in the Renegade Electronics final. But, Gary would not be satisfied with a finals exit via a false start, as he fought his way to redemption in the Renegade Non-E bracket, making his way to the finals against Danny Oro's 72 Pontiac. This time, he'd get off the line just fine, but it was the finish line that was a problem for Gary. Gary would finish the 1/8th of a mile in 7.694 seconds... on a 7.72 second dial. By finishing .026 seconds early, he'd disqualify himself and lose another final... if his rival, Danny Oro, didn't finish with a 7.301 on a 7.33 dial, finishing .029 seconds early, and also breaking out. The scant 3 thousandths of a second difference was what Gary needed to take the Renegade Non-E win. With the Renegades off to a good start, we'll have the Import Outlaws racing down the track next week on Saturday, the 24th. See you there! 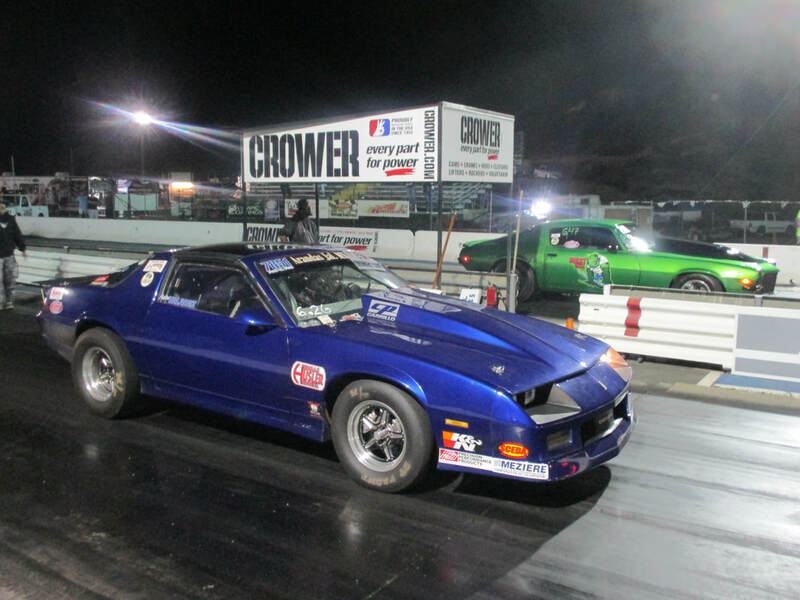 Saturday night, on the first of September, 2018, the 2018 Crower Cup series came to a close at Barona 1/8th Mile Dragstrip in Lakeside, California. Going into the third and final race, Rick Reynolds had a commanding lead, with RJ Simrock, Todd Ferguson, and Paul Wagner having outside shots for the championship if Rick is eliminated early. And there was good news on that front, as Rick dropped out early, entering the cash prize Gambler and making his way to the finals, matched up against Jeff Martin. Jeff's .085 reaction time wasn't bad, but Rick's .054 was better. And when Rick right on his dial, with a 5.933 E/T on a 5.93 dial, he made it impossible for Jeff to win. Jeff would break out, and Rick would take the Gambler cash prize. In the Crower final, Pedro Valadez (Near) lined up against Noel Cuevas (Far). 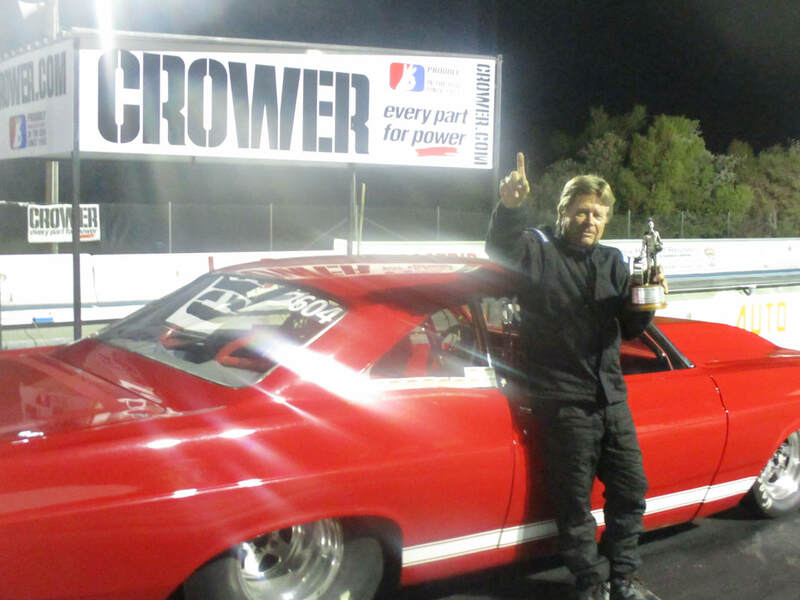 But when the points are added up, RJ, Todd, and Paul could not get enough of a push, as Rick Reynolds and his 66 Fairlane take the Crower Cup! Rick takes home a Wally and some Crower merchandise for his troubles. Now, come back in two weeks on the 15th for the return of the Renegade, as well as Member Track Madness! Races start at 4PM. See you there! What happens when the NHRA Summit, Top Fuel Dragsters, and an old fashioned Nitro shootout all get together in the same place? 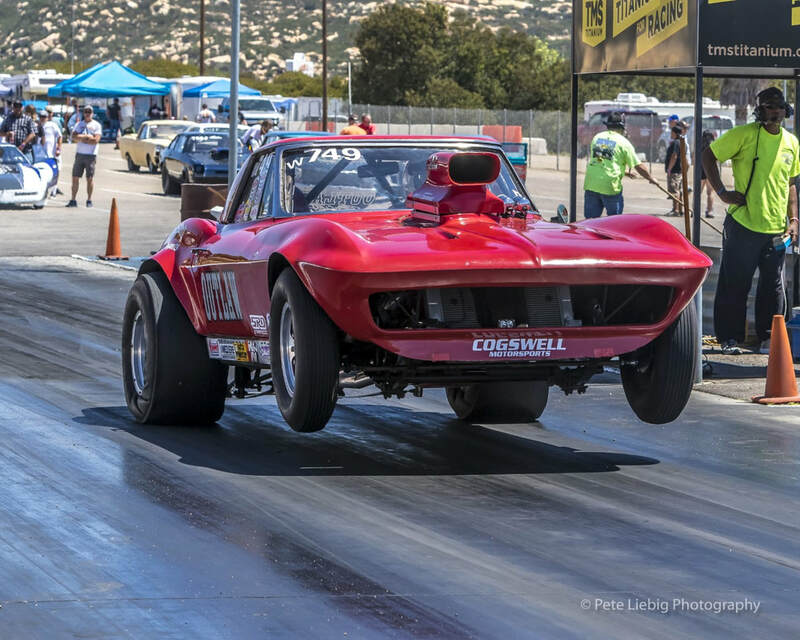 You get Saturday, July 21st at Barona 1/8th Mile Dragstrip in Lakeside California, where the Summit Series #7, SoCal Doorslammers, and the Prolight Series all shared the stage with the Fuel Altered Top Fuel Dragsters for a night full of intense racing action. 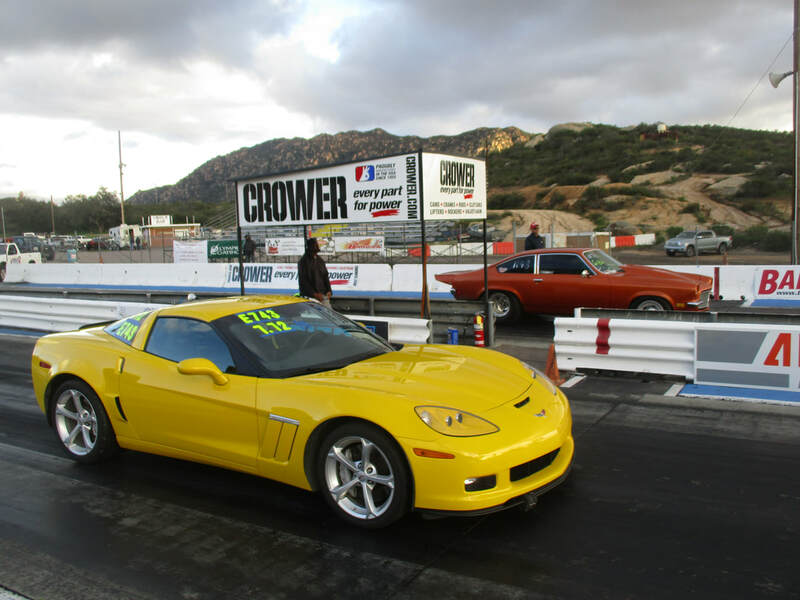 First, we'll go over the SoCal Doorslammers, and their 6.50, 5.90, 5.50, and Run What You Brung brackets, all heads up races with dials set to the same amount leading up to the Run What You Brung, which is a straight up fastest-to-the-line drag race. 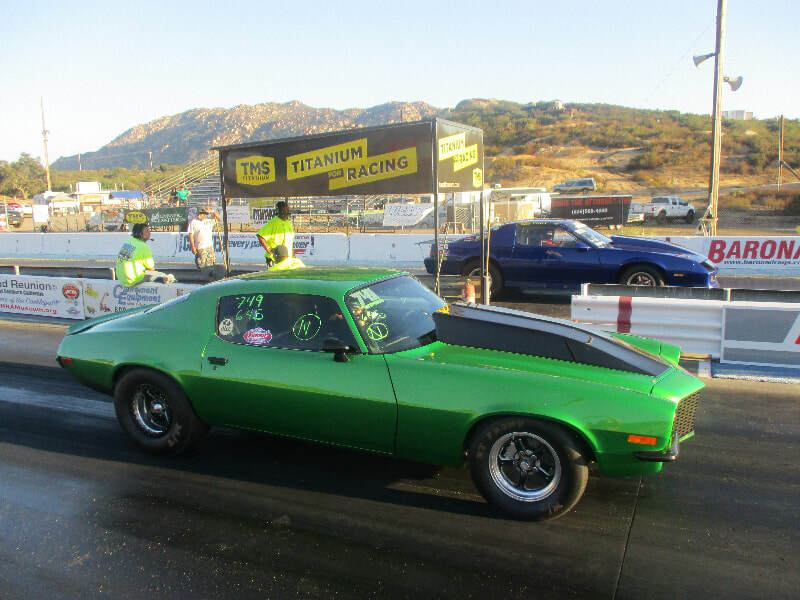 In the 6.50 class, Noel Cuevas and his 71 Camaro was up against Steve Beck Sr and his 39 Chevy. Noel got off the line quicker, and that was enough for Steve to decide he had enough. Noel finished with a 6.506 on that 6.50 limit, while Steve didn't finish at all, giving Noel the 6.50 win. 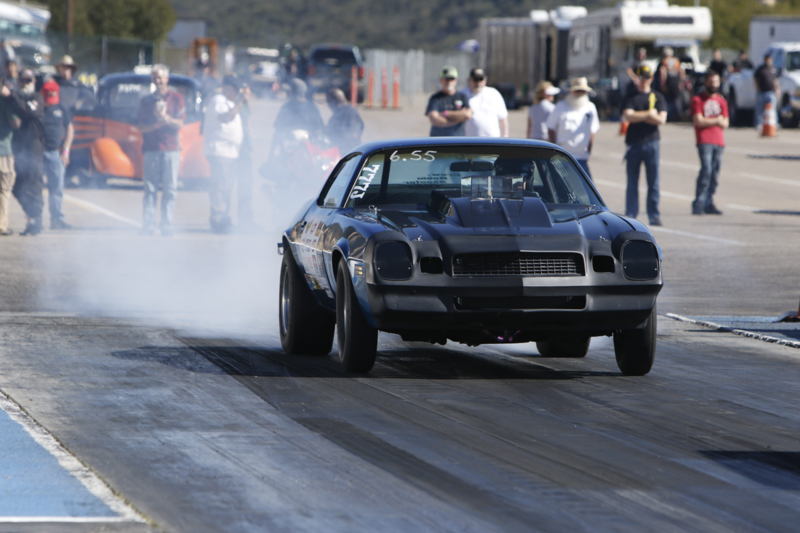 Things got a little faster in the 5.90 bracket, as Rich Wood and Rick Reynolds dueled it out. Rich's .070 reaction time gave him a head start over Rick's .109, and it was enough of a head start to give Rich the win, making up for his slightly slower 6.020 E/T compared to Rick's 5.985. 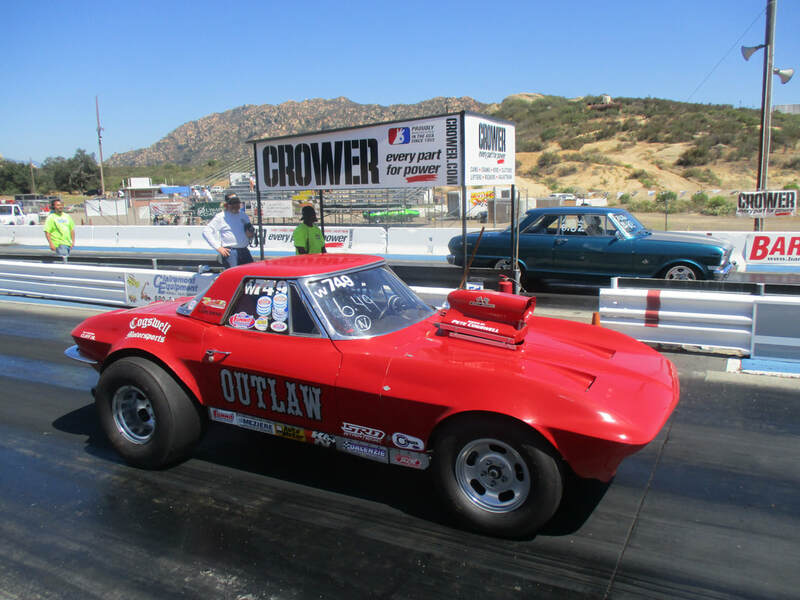 Another gear faster: In the 5.50 bracket, Lary Middlebrook's 87 Corvette matched up against Tommy Azzarella's 64 Nova. In what was the closest race of the night, Lary had a 5 thousandth's of a second advantage off the line with a .024 compared to Tommy's .029, but Tommy's E/T was 5 thousandths of a second faster, with a 5.553 beating Lary's 5.558. The winner? By a matter of tens of thousandths of seconds, Lary's 125 MPH run would take the 5.50 win. And finally, it was left to the Fastest of the Doorslammers: The Run What You Brung bracket. 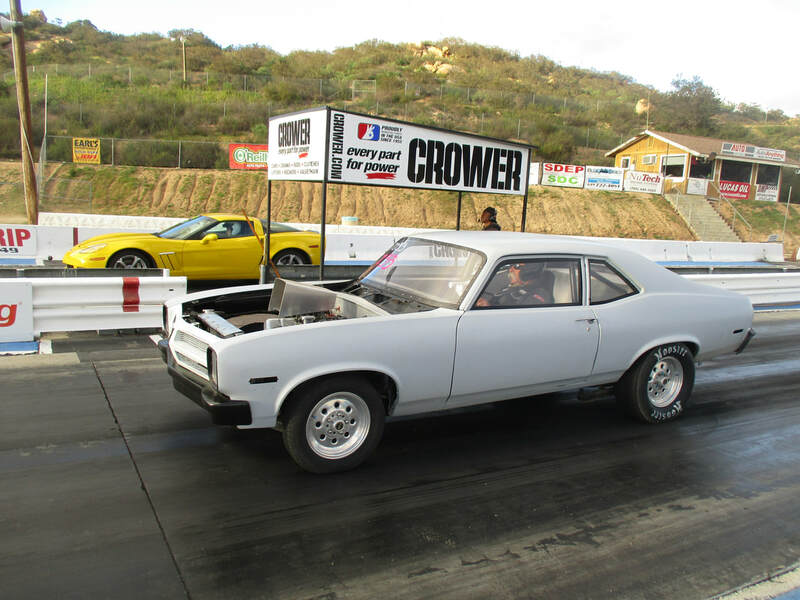 No limits, just a straight up drag race, with RJ Simrock's 70 Nova going up against Travers Scott's 85 Mustang. And while with no limits, it should come out to the fastest car wins, the true race was once again at the starting line. RJ's .08 second head start off of it beat out his .01 E/T lead, stacking together to give RJ and his 156 MPH machine the Run What You Brung win. 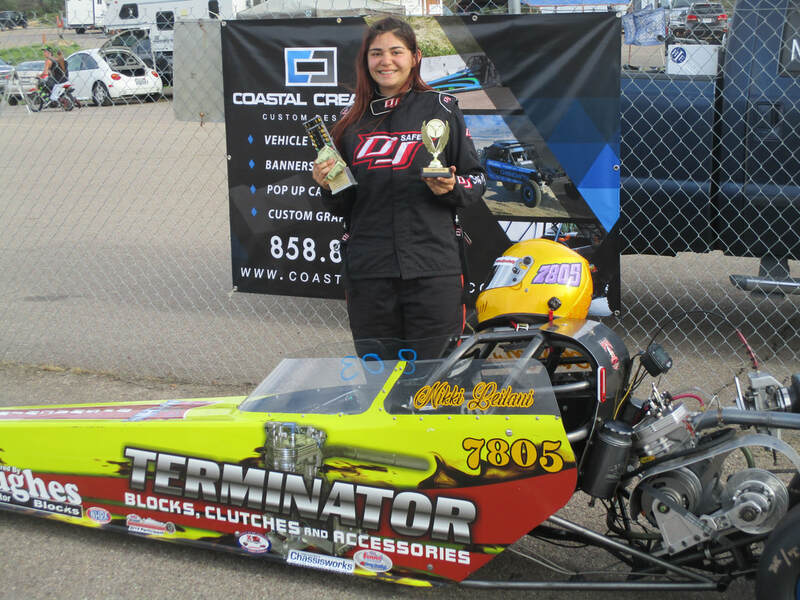 With the Doorslammers taken care of, it's a race for NHRA Gold that's next. The 7th race of the NHRA Summit series, with the Summit Motorcycles, Summit Sportsman, Summit Pro, and Summit Super Pro all up for grabs. The series goes back to traditional bracket racing, with both racers entering in a dial, and whoever is closest to their without their E/T going under taking the win. In the Summit Motorcycle bracket, Joe Silva was up against Russ Collins Jr. Joe would be given a 2 second head start, having the slower bike. Both bikes were on their game as they got off the starting line, with Russ barely beating Joe out with a .006 reaction time compared to Joe's .009. In the end, it was Russ' 8.838 E/T on a 8.79 dial that'd get him the Summit Motorcycles win. In the Summit Sportsman bracket Gary Harfield dueled David Puetz. Both were nearly perfectly even off the starting line, but Gary's 7.893 on a 7.89 dial beat out David's 7.673 on a 7.65 dial, giving him the Summit Sportsman win. 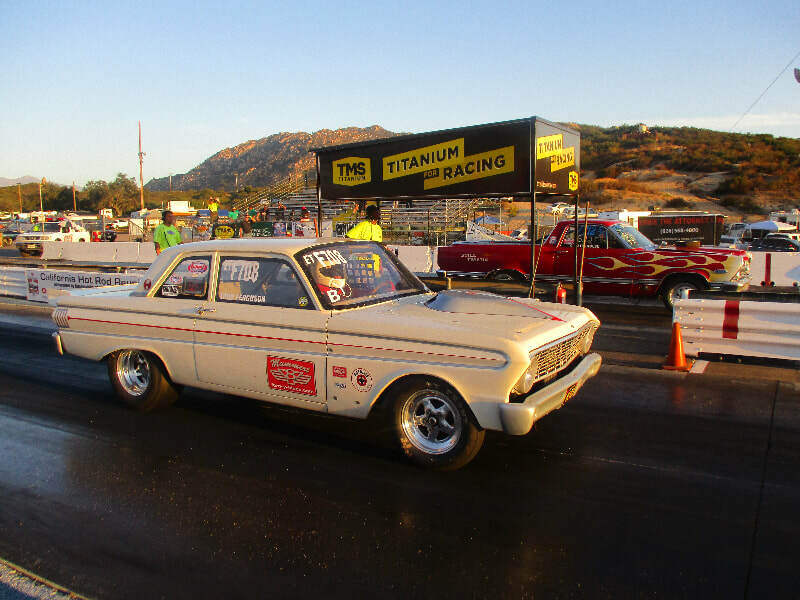 Next, to Summit Pro, where Rick Reynolds and his 66 Fairlane was matched up in the finals against Jeff Martin and his 74 Datsun. Rick's .035 reaction time gave him quite a head start over Jeff's .111, forcing Jeff to push his car as hard as he could. He finished with a 6.611 on a 6.63 dial, breaking out and giving Rick the Summit Pro win. And finally, in the Summit Super Pro bracket, RJ Simrock and Noel Cuevas would meet up. Throughout the day, racers were getting absolutely insane reaction times within the hundredth of the second, but Noel broke that streak by a lone thousandth of a second. 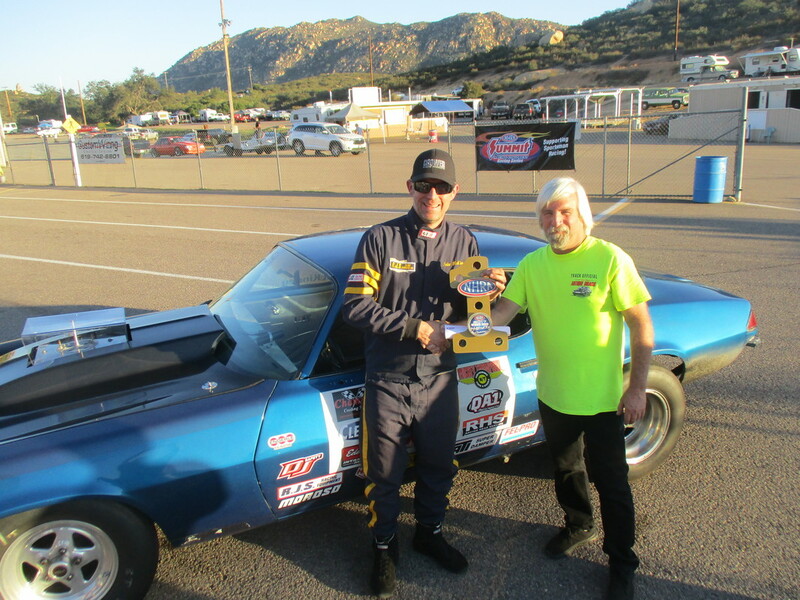 With a -.001 reaction time, Noel fouls out and gives RJ Simrock the Summit Super Pro win. 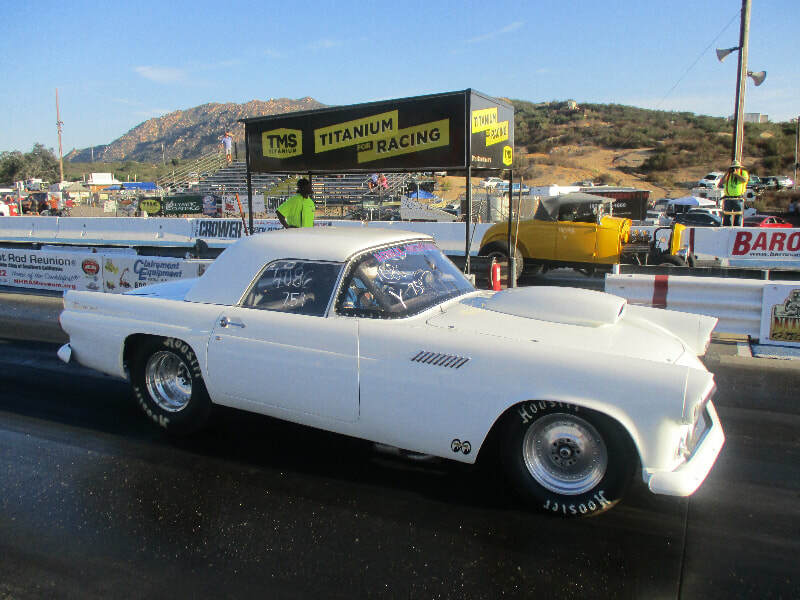 With Saturday's crazy runs over, everyone went home and waited for Sunday morning, where the NHRA Summit series would take a second shot. Sunday's sunny day served as a grand backdrop for the NHRA Summit Series #8. In Sunday's Summit Motorcycle, Joe Silva had a second shot at the win, but Corey Wilcox's 06 Suzuki and his 6.008 E/T on a 6.00 dial would be too much for him, as Corey takes Sunday's Summit Motorcycle win. The Summit Sportsman was a rematch of Saturday, as Gary Harfield met up with David Peutz once again. David would give it his all, but Gary's better reaction time and 8.044 E/T on a 7.99 dial was not getting beat today, giving Gary the Summit Sportsman Weekend Sweep. Summit Pro came down to Noel Cuevos went up against Barry Brown. 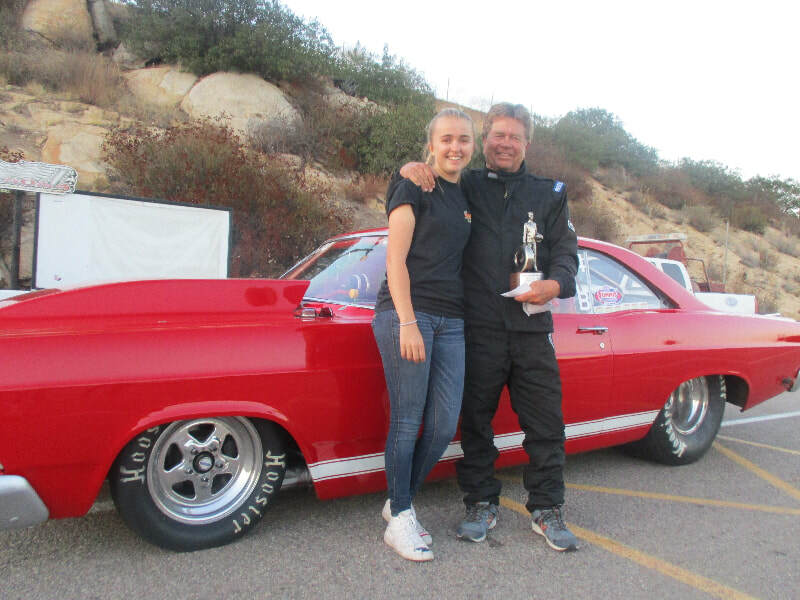 Barry's 66 Chevelle got a small head start with a .044 reaction time, but Noel's .050 reaction was still quick enough to secure the win while running a 6.672 E/T on his 6.67 dial, giving Noel Sunday's Summit Pro win. And to wrap up a wild racing weekend, the Summit Super Pro brought back track favorite “Woody” Wood, as RJ Simrock came to try and give Woody an upset. RJ was faster off the line, but Woody's 6.614 E/T on a 6.50 would be enough to take the Summit Super Pro win, and wrap up this wild weekend of racing! With this wild weekend done, our next event would be Friday, August 16th, when the track is open for all drivers to come and give their cars a test run, as starting at 2 PM, the track is open for test and tune. 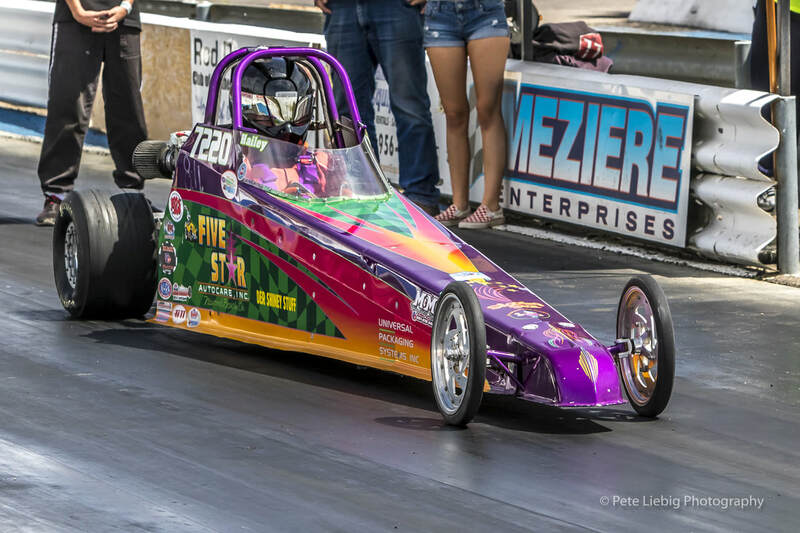 Then, on Saturday the 17th and Sunday the 18th, the NHRA Junior Dragsters are bringing the kids to the strip, starting at 10AM! See you there! 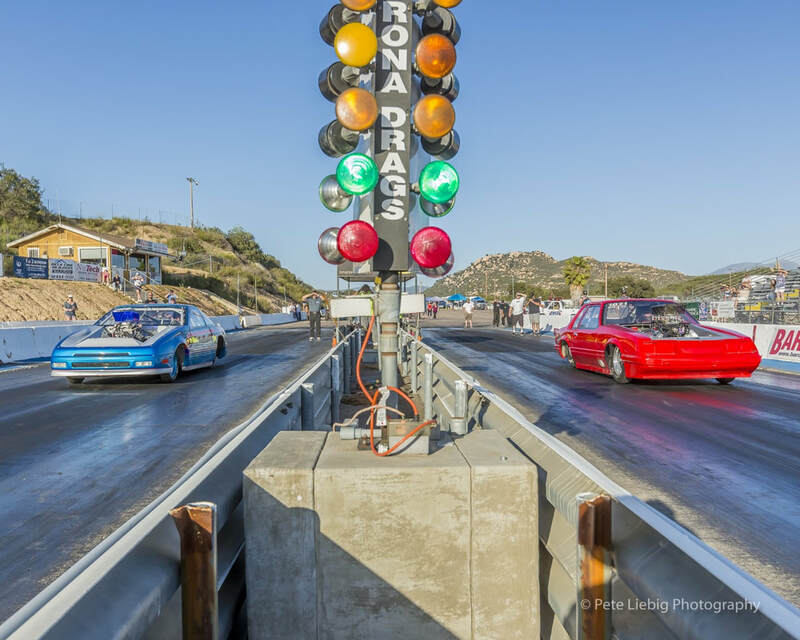 The NHRA made a comeback to Barona 1/8th Mile Dragstrip on June the 22ed and 23rd as the NHRA Summit Series got to stages 5 and 6, with 6 being the NHRA All-Access Challenge, where every winner would get their own coveted Wally trophy! 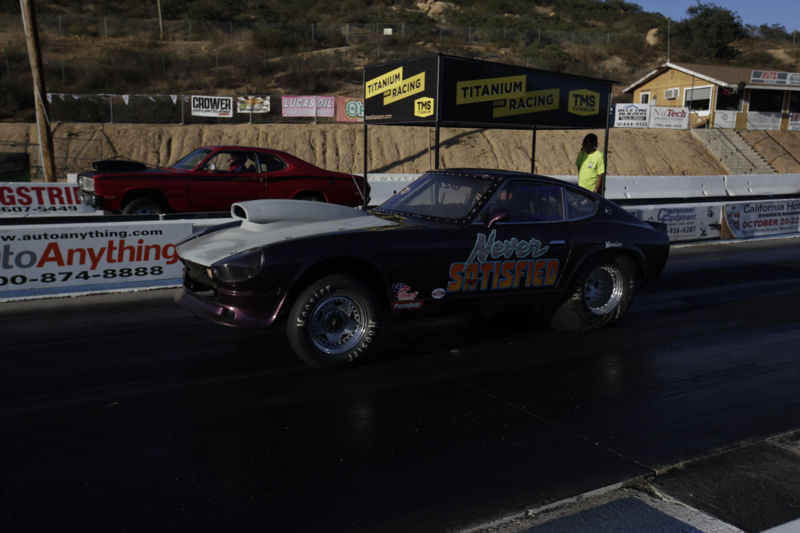 Saturday started off with the Gambler, where Jeff Martin's 74 Datsun went up against Lee Sweiter's 92 Ford Mustang for the cash prize. Lee's Mustang nailed it's 8.96 dial with a 8.964 E/T, but a snooze-worthy reaction time of .141 left plenty of room for Jeff to grab a win. And even with a far less impressive 6.768 E/T on a 6.68 dial, a .019 reaction time gave him more than a tenth of a second advantage over Lee, and that would be enough to give Jeff the Gambler pot. In the Summit Motorcycles bracket, David Collins' 83 Kawasaki was matched up against Joe Silva's 80 Suzuki bike. David's 5.889 E/T on a 5.87 dial would give him the win over Joe's 6.667 E/T on a 6.45 dial, giving David Collins the Summit Motorcycle win. Next, in the Summit Sportsman bracket, Paul Wagner met up with Gary Harfield in the final, where Paul's delay at the line would cost him. His .140 reaction time gave Gary, who had a .068 R/T, over 7 hundredths of a second of an advantage. And while Paul ran well with a 7.642 E/T on a 7.62 dial, said reaction time meant that all Gary would need is a 7.962 or better on his 7.89 dial. His 7.957 would be good enough to take the Summit Sportsman win. In the Summit Pro bracket, Tracy Perez was up against Noel Ceuvas, jockeying for points in the year-long series. Noel seemed to want it more, being unable to wait for a green light as they launch 30 thousandths of a second early, fouling out and giving Tracy the Summit Pro win. 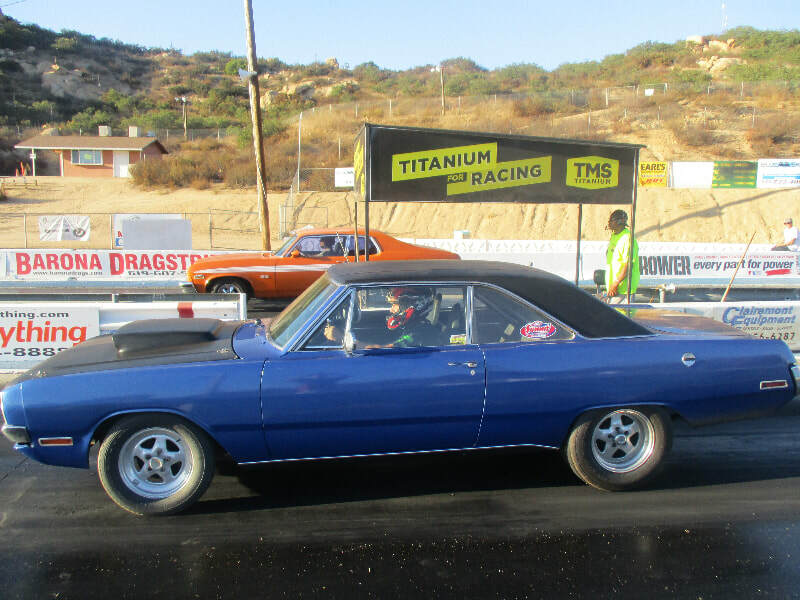 Summit Super Pro came down to Rick Reynolds and his 66 Fairlane up against RJ Simrock and his 70 Nova. 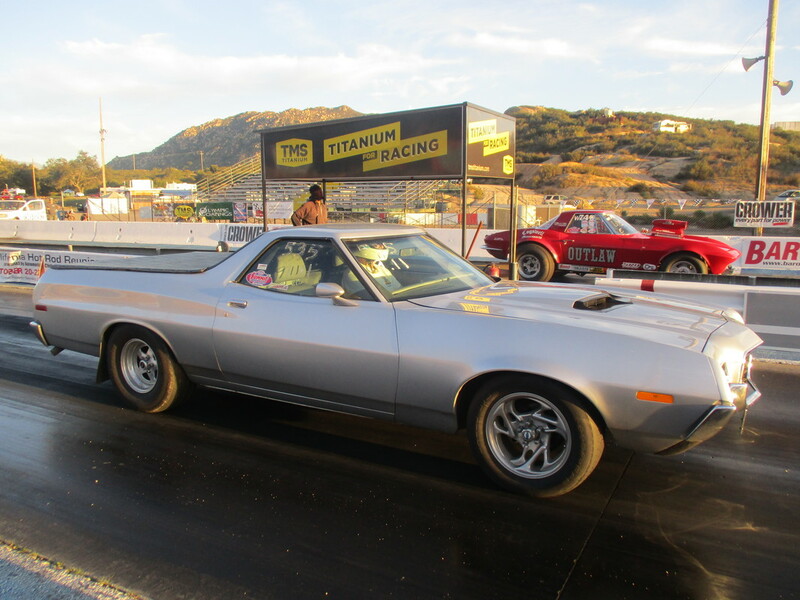 Both racers were near-even off the line, but Rick's 5.903 E/T on a 5.89 was just a hair closer than RJ's 6.559 E/T on a 6.54 dial, giving Rick the Summit Super Pro win. With Saturday night taken up, everyone got started up again for Sunday afternoon. But this time, there was a coveted NHRA Wally trophy on the line for all the Summit winners. But before that, the cash of the Gambler needed to be handed out. Craig Wesser brought his 63 Nova to try and get the lion's share of it, but Jim “Woody” Wood's 63 Corvette had something to say about that. Jim had a slow launch, but Craig pushed his car too far, getting a 8.761 E/T on a 8.82 dial, unpressed by Woody's own run. With that breakout, Woody would take the Gambler win. In the Summit Motorcycle bracket, Joe Silva was looking to improve on his runner up performance on Saturday, while Corey Wilcox's 06 Suzuki was looking to take a Wally for itself. Of course, it's hard for Corey to get that Wally when he takes .260 seconds to get off the line. Such a gap gave Joe an easy ride to a 6.665 E/T on a 6.50 dial, and to the Summit Motorcycle win, complete with a new trophy to put on his rack. In Summit Sportsman, Paul Wagner was looking for vengeance against Gary Harfield, but the memory of his bad .140 start haunted him dearly. Paul would be off by nearly .140 again, but this time it was too early. 132 thousandths of a second early, giving him the red light and gifting Gary Harfield the Wally and the Sportsman Sweep. 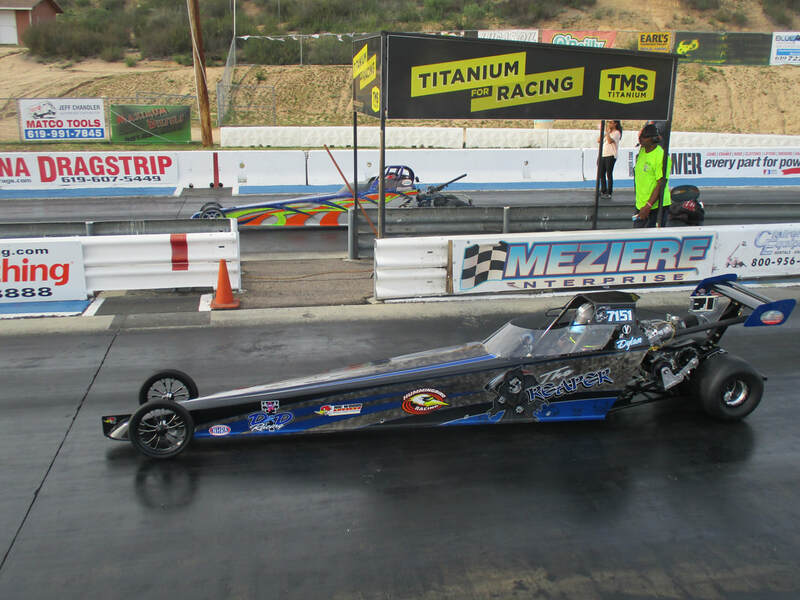 In the Summit Pro bracket, Noel Cuevas was taking a second shot at things, but Daniel Switzer wanted some NHRA gold of his own. And when Daniel starts off with a .002 reaction time, while Noel naps with a .114, it's not hard to guess who took the win. Daniel's 8.250 E/T on a 8.22 dial would take the win, and the Summit Pro Wally. With the Summit done and gone, we look towards next week, when on Sunday, the 1st of July the Import Outlaws come to town, followed by the Crower Cup and AFX series continuing a week after on Saturday, July 8th. See you there! 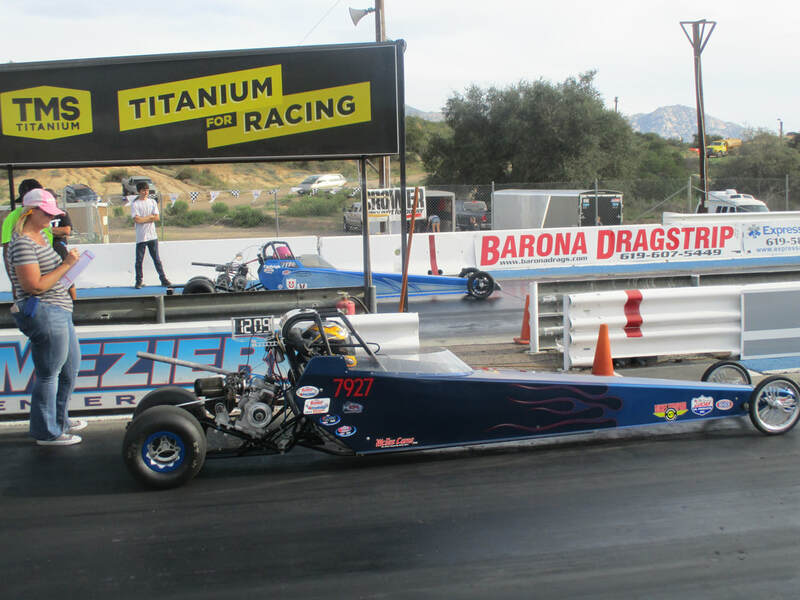 The NHRA Summit hit Barona 1/8th Mile Dragstrip this April 14th and 15th, and they brought a friend! 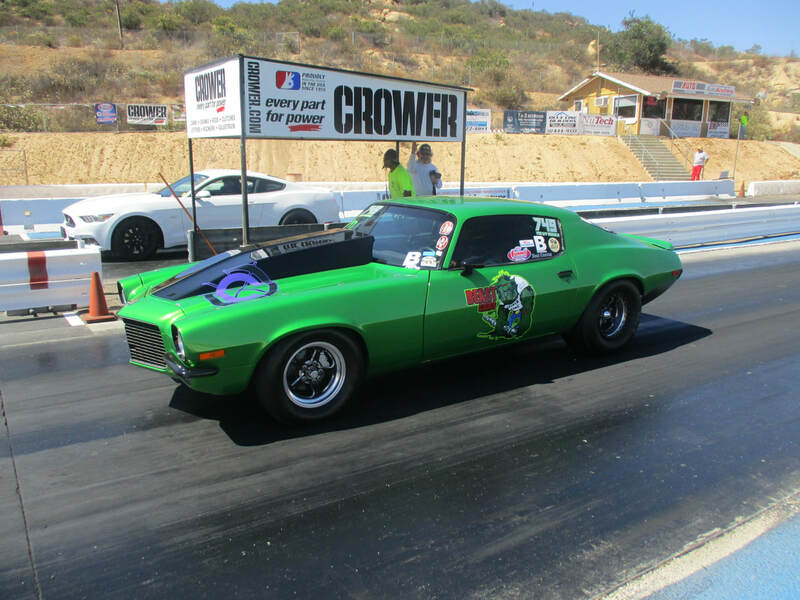 On Saturday, the SoCal Doorslammers series paid a visit as well, bringing it's own set of hard bracket racing down to the track! ​Saturday the 14th was a day filled with sunshine, warm weather, and hot racing. First, the NHRA Summit series took it's first shot at the weekend with it's Summit Motorcycle, Sportsman, Pro and Super Pro brackets. In Summit Motorcycle, there was a family rivalry brewing as David Collins brought his 83 Kawasaki up against Russ Collins Jr's 08 Suzuki. Russ would be going first, being given nearly 3 seconds of a head start, but all that meant here was that David did not need to do anything at all, as Russ left 4 hundredths of a second early, fouling out and giving David the Summit Motorcycle win. David Collins, before making a run on his way to winning Saturday's Summit Motorcycle bracket. 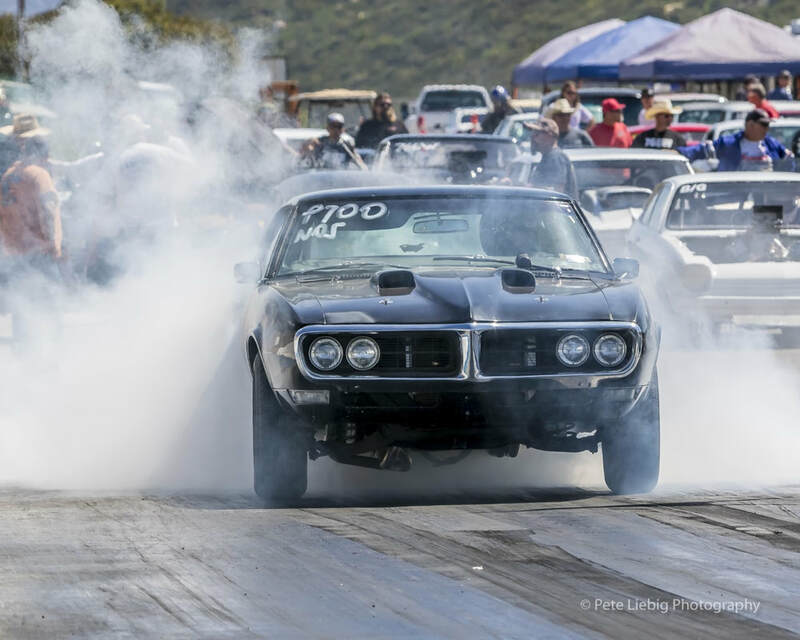 In the Summit Sportsman, Kyle Phillips was aiming for the top, but David Peutz and his 68 Firebird was in his way. Kyle was eager to get a good reaction time, but he was a little too eager:launching 24 thousandths of a second early and fouling out, giving David Peutz the Summit Sportsman win. David Puetz's 68 Firebird, burning out before a run for Summit Sportsman. 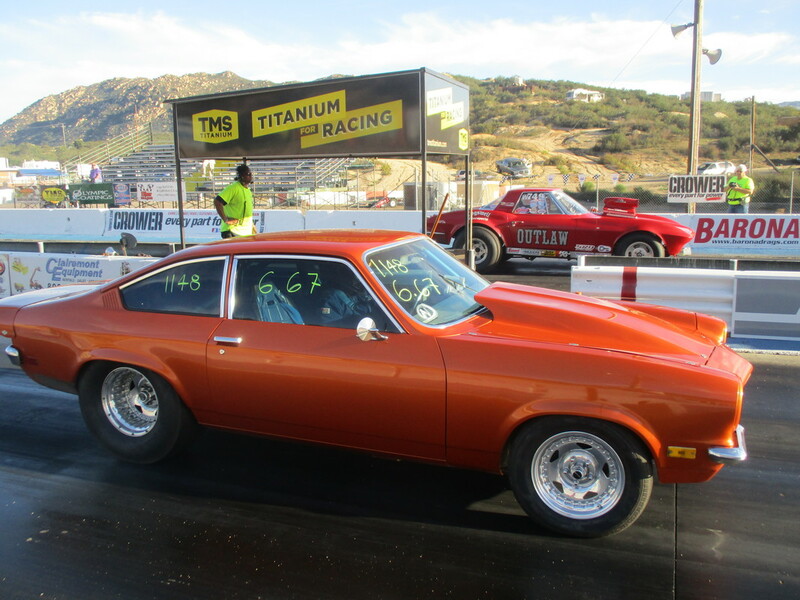 Summit Pro was next, with RJ Simrock bringing his high wheeling 70 Nova to the finals, where he'd meet up with Daniel Switzer's 15 Mustang. No red lights or break outs would befall these two, as both racers finish clean. Both got to a good start, but RJ had a small advantage, getting a .051 reaction time compared to Daniel's .080, giving RJ 29 thousandths of a second of an advantage. He would need them, as Daniel finished with a 8.290 E/T on his 8.28 dial. But, those 29 thousandths combined with a 6.410 E/T on a 6.38 dial, he was .081 thousandths of a second away from a perfect race, beating Daniel's .090 margin by a scant 9 thousandths, just barely getting the win light and the Summit Pro win. And to wrap up Saturday's Summit Series, the Super Pro bracket came down to Noel Cuevas's 71 Camaro and David Butler's 74 Vegas. Both racers got off the line quick, and went down the track quicker... too quick. Both drivers would go under their dial and break out, but Noel's 6.443 was closer to their 6.38 dial than Daniel's 6.711 was to their 6.77 dial, giving Noel the lesser breakout, and the Summit Super Pro win! 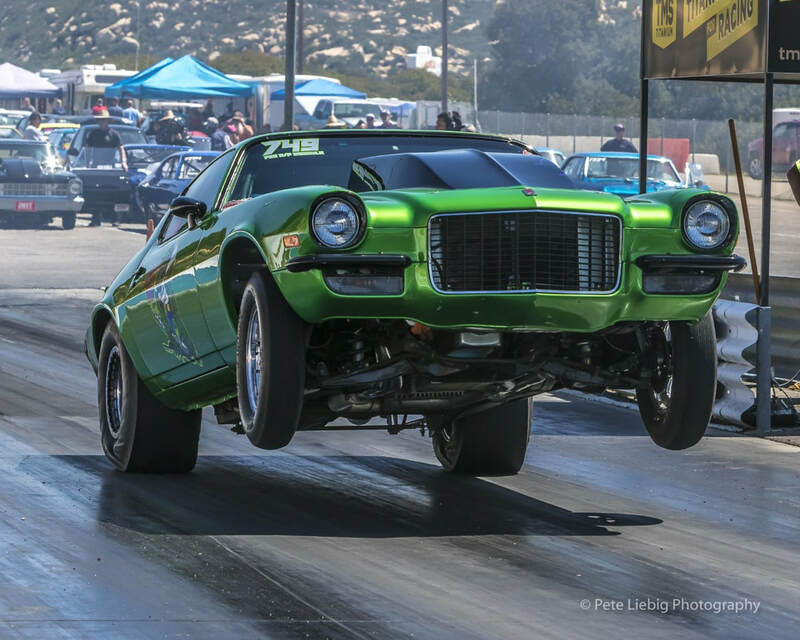 Noel Cuevas' 71 Camaro, wheeling while launching off the line. The Summit series would run again on Sunday, but Saturday wasn't done yet! The So Cal Doorslammers had to make their runs. They had 4 categories of their own, based on the set in dials: the 6.50 bracket, the 5.90 bracket, the 5.50 bracket, and the no limits, heads up racing of the Race What You Brung bracket! Starting with the 6.50, track regulars Jim “Woody” Wood and RJ Simrock were ready to run. Both dials were matched at 6.50, thus when the lights dropped it was all about trying to get down the track as fast as you can without going under... however, both racers were a little too fast for their britches here. 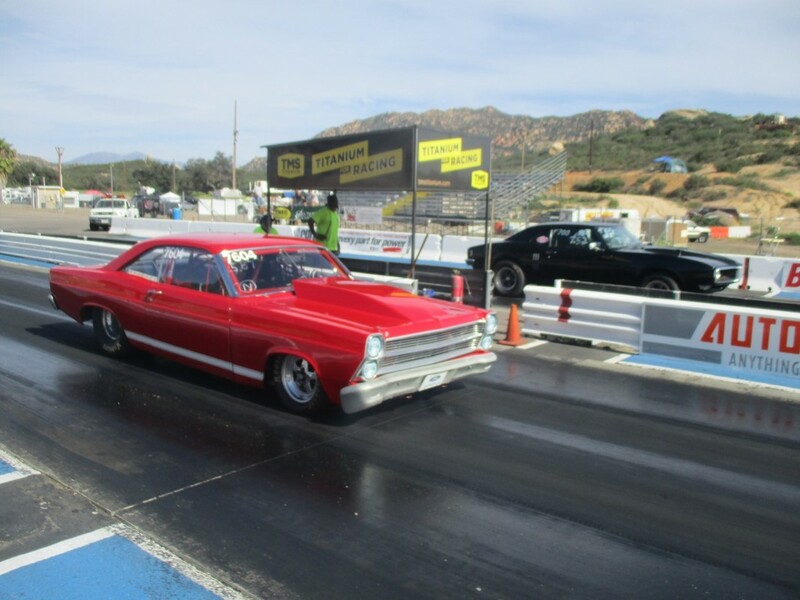 Woody's 6.471 was closer to 6.50 than RJ's 6.434, thus giving Woody the 6.50 win. In the 6.50, Woody took the win with a few good jumps like this. 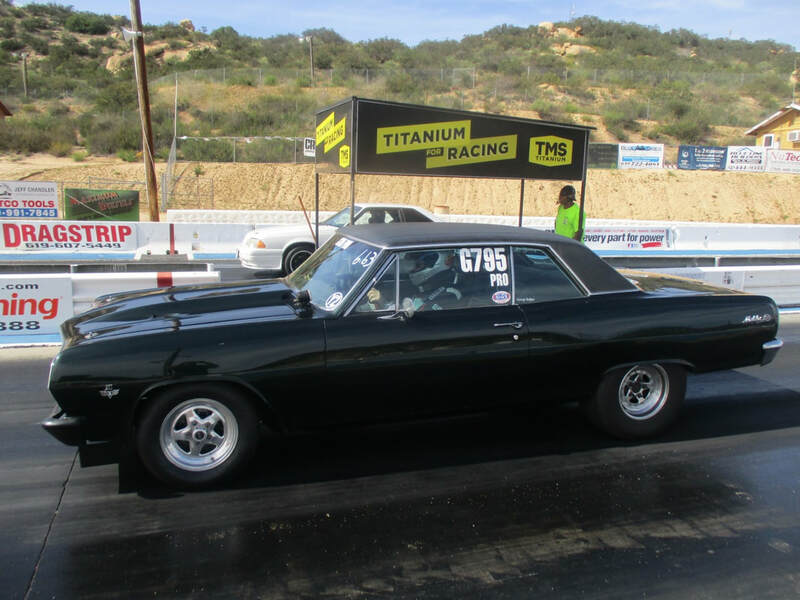 In the 5.90 bracket, Don Ruble Jr's 67 Nova would meet with Dennis Roach's 69 Chevelle. The heads up lights would drop, but Don would launch a hundredth of a second early, getting the red light and gift wrapping the 5.90 win to Dennis Roach. We're getting faster as we go along, as we go from the 100 MPH beasts of the 5.90s to the 120+s of the 5.50s! 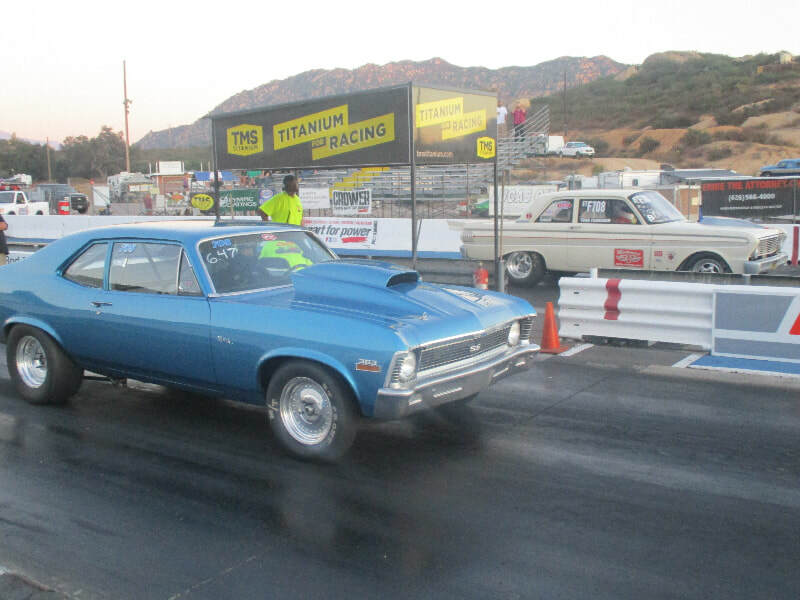 Joe Bernier's 72 Vega was no slouch, but Tommy Azzarella's 64 Nova thought it was even faster. And it was, as it rocketed down the track at 127 MPH. But it'd finish with a 5.492 E/T, going under the required 5.50 dial and breaking out, giving Joe Bernier the 5.50 win. Joe Bernier burning out before a run in the 5.50 bracket.And now, for the fastest cars of Saturday, the no-dial in, heads up, no limits Run What You Brung bracket. 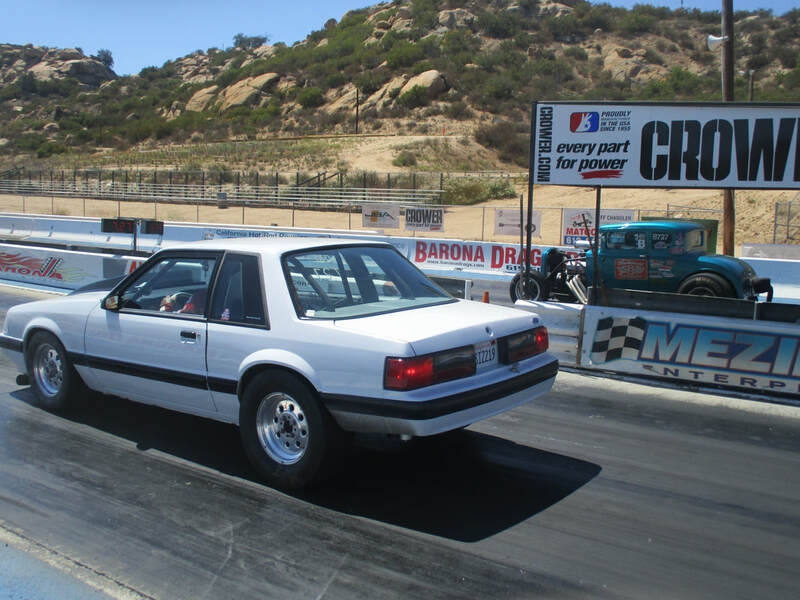 Jorge Luna's 93 Probe wanted a shot of high speed glory, but Travers Scott's 85 Mustang thought it was one better. The lights dropped, and Jorge's Probe fired off, crossing the finish line with a 4.851 E/T, going 143.97 MPH... but Travers' Mustang hit 149.60 MPH, and crossed the line 4 hundredths of a second earlier, giving Travers' the Run What You Brung win, wrapping up a fast night of So Cal Doorslammers! Jorge Luna (Left) against Travers Scott (Right) in the Run What You Brung final. 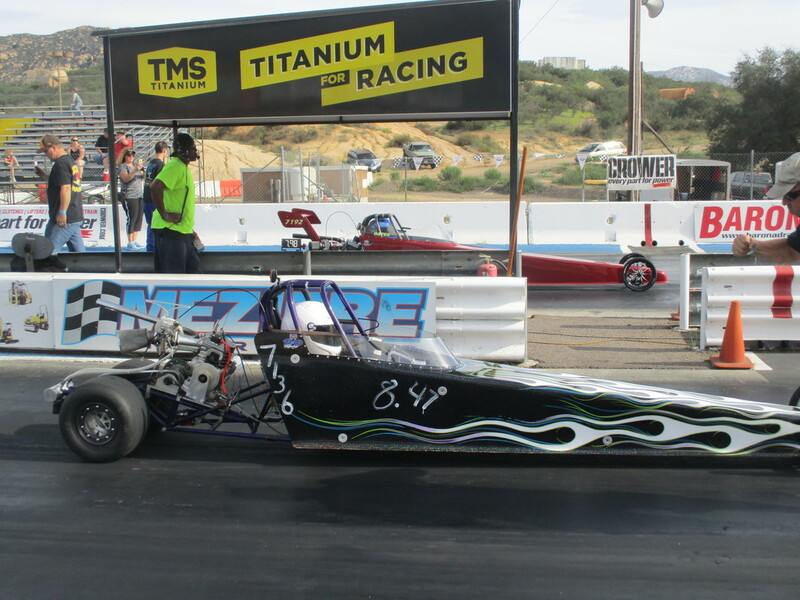 But the NHRA Summit was back on Sunday the 15th, and they brought another batch of their fast NHRA racing. The Summit Motorcycles, Pro, Super Pro, and Sportsman was there, as well as the return of the Gambler, where eliminated racers can enter for a chance at a cash prize. For said Gambler bracket, it came down to Lee Sweiter's 92 Mustang and George Rodgers' 65 Chevy Malibu. George got a good start off the line with a .066 R/T, but Lee felt a little more dangerous, pushing his luck for a fast life. 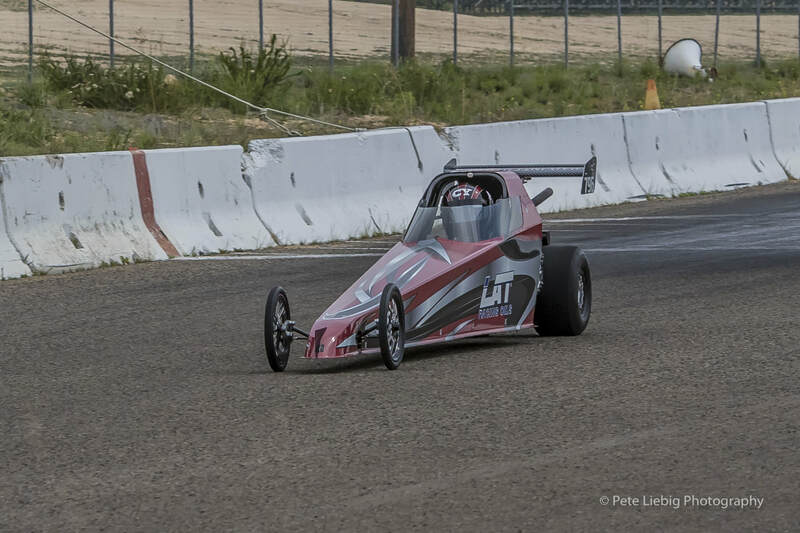 It paid off this time, as a .005 R/T gave him a crucial 6 hundredths of a second advantage down the track. One he would need, as George finished with a 6.654 E/T on a 6.63 dial. But thanks to that fast start, Lee's 9.294 E/T on a 9.22 would be enough to take home the cash from the Gambler win. And with the bonus money handed out, it was time for the Summit proper. 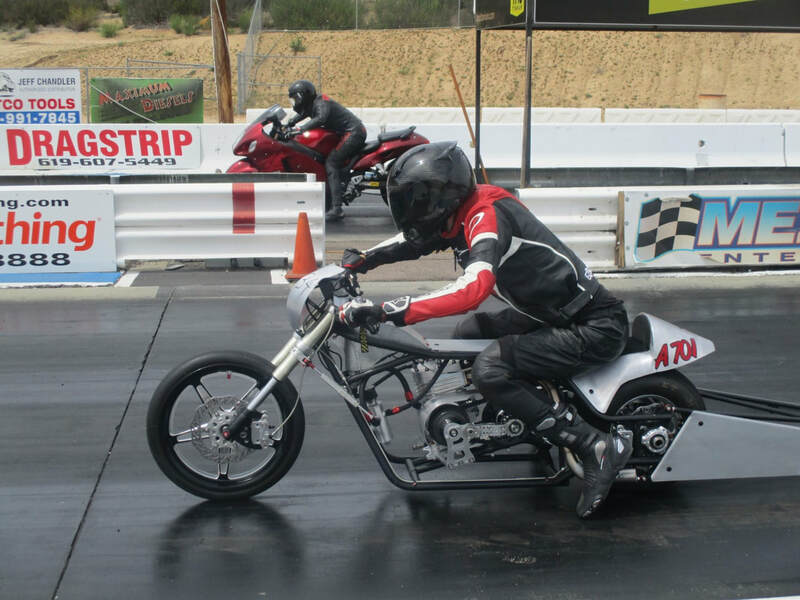 In the Summit Motorcycle bracket, Corey Wilcox was up against Joshua Allen in the final. Corey had a slow start off the line with a .236 R/T, but that was likely due to Joshua leaving 72 thousandths of a second early, fouling out and giving Corey the Motorcycle win. In Summit Sportsman, Gary Harfield clawed his way up to the final, and there he found Saturday's champion, David Puetz, who was going for a weekend sweep. David took a chance trying to get the second win of the weekend for him. And with a reaction time of 2 thousandths of a second, he did just that. Although, getting a 7.530 E/T on a 7.52 dial certainly helped, as David speeds his way to the win and the weekend Summit Sportsman sweep. 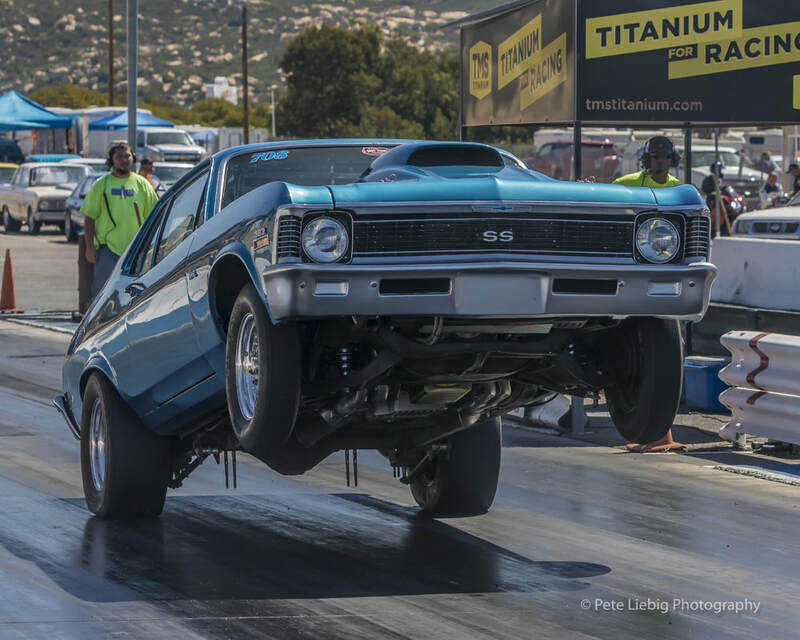 The Summit Pro bracket came down to Rick Reynolds and his 66 Fairlane and David Peutz and his 68 Firebird, fresh off the Summit Sportsman sweep. David tried out the same strategy he did in the Sportsman, and aimed for a super low reaction time, but he bit off more than he could chew here: launching one hundredth of a second early and getting a red light foul for it, gifting Rick Reynolds the Summit Pro win. Rick Reynolds (Near) shortly before defeating David Puetz (Far) and taking the Summit Pro win. And finally to close out the day, Noel Cuevas fought his way back to the Summit Super Pro final, going for a weekend sweep of his own. 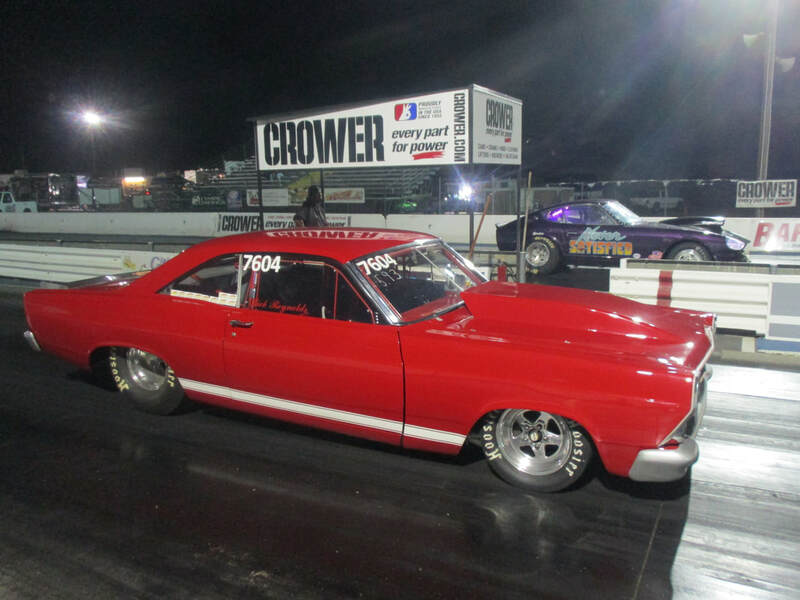 RJ Simrock and his 70 Nova wanted another win under his belt too, and only one of them was going to take the Super Pro win. It'd be practically a heads up race, with Noel's 6.45 dial giving him only the tiniest head start over RJ's 6.42. 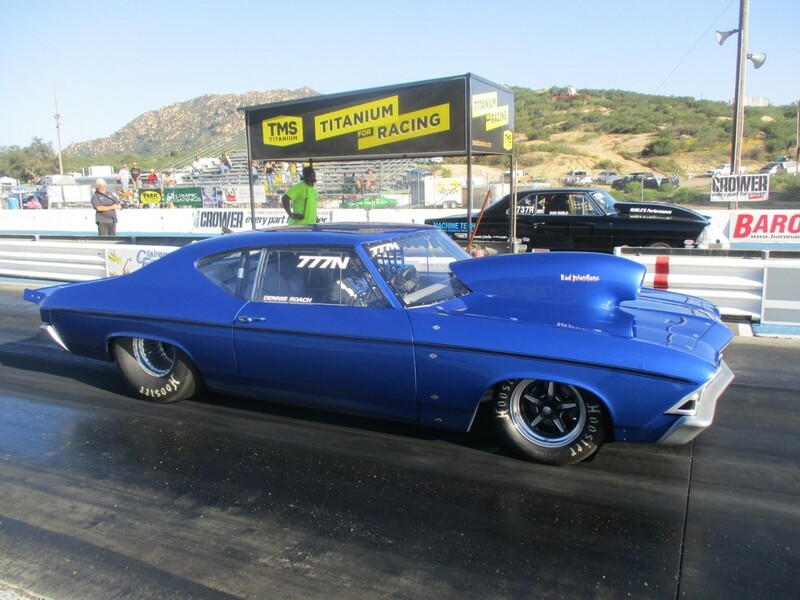 It was decided at the finish line, as Noel's 6.460 E/T on a 6.45 dial would be enough to beat RJ's 6.654 E/T on a 6.548 E/T on a 6.42 dial, giving Noel the Summit Super Pro weekend sweep! Noel Cuevas (Near) against RJ Simrock (Far) in the Summit Super Pro finals. Noel would sweep the weekend series with this win. With an exciting Summit and Doorslammers weekend finished up, we look forwards to two weeks from now, when on Friday April 27th, an open track rental is open for all cars starting at noon, Saturday April 28th has the 54th running of the San Diego Antique Drags starting at 10 AM, and Sunday has the Import Outlaws return to Barona 1/8th Mile Dragstrip, starting at 10 AM as well. See you there! 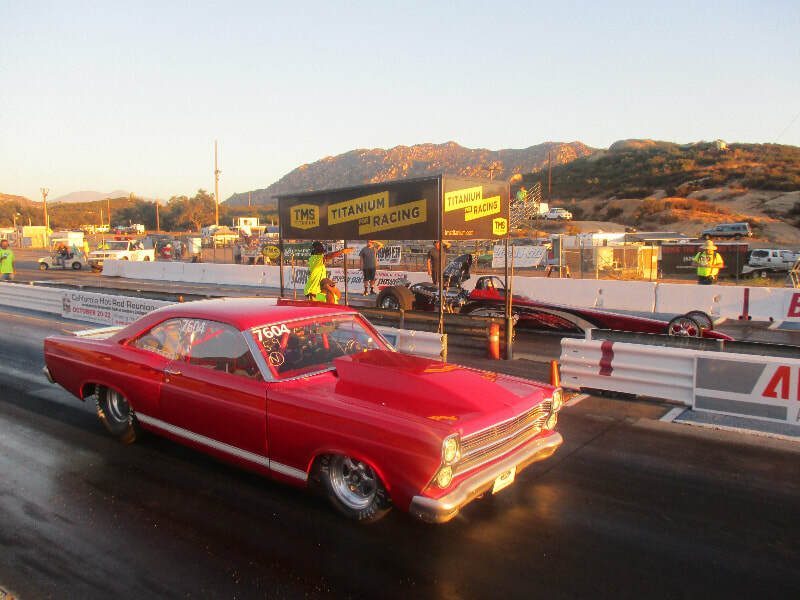 Love is in the air at Barona 1/8th Mile Dragstrip; not for Hearts or Money, but for the thrill of race! Over the weekend of February 17th and 18th, on a sunny day down in Lakeside, California. Saturday saw the return of the Renegade series for their second race of the season, while Sunday saw the varied styles of the Import Outlaws running their ways up and down the track. But the weekend starts with Saturday, and the Renegade gets everything started! 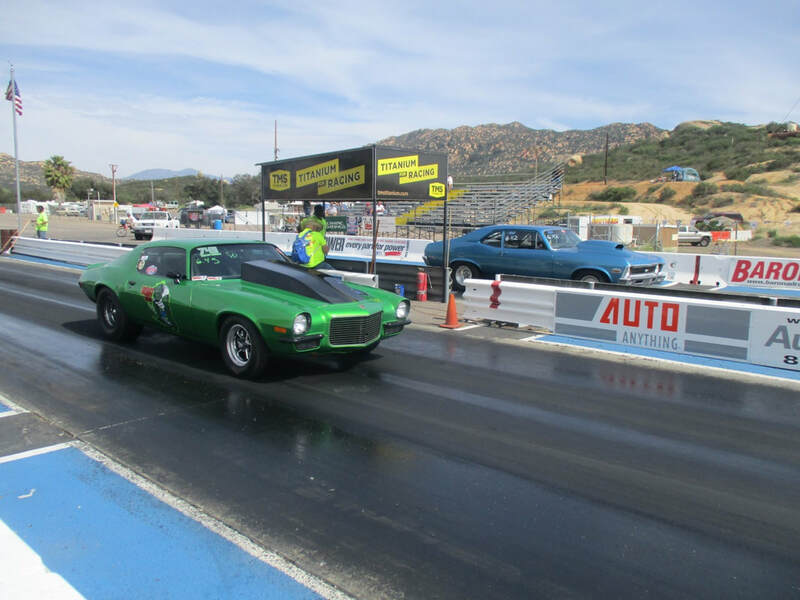 First, in the Renegade Electronics class, the final came down to Daniel Munoz and his 71 Vega, and Jim “Woody” Wood, who brought his 63 Corvette. 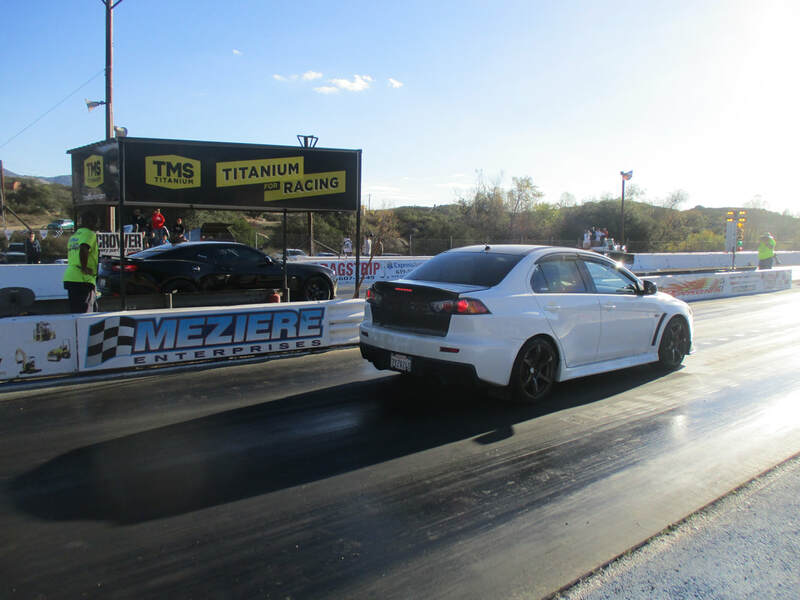 The two cars were nearly evenly matched, and when the lights went down, both were evenly matched coming off the line. It came down to the track itself, where Daniel's 6.690 E/T on a 6.67 dial just barely beats Woody's 6.432 on a 6.40 dial, giving Daniel the Renegade Electronics win. Daniel Munoz (Near) against "Woody" Wood (Far) in the Renegade Electronics final. Woody wasn't done yet, though, as he fought his way back into the Renegade Non-E Final to make up for his defeat. His revenge would have to come against old track favorite Wayne Johnson and his 68 Mustang. Wayne would get the head start, with his 9.11 dial compared to Woody's 6.45start, giving Woody a nice head start. But when the lights came down, Wayne launched early, getting a -0.024 reaction time. And just like that, Woody made up for his loss by taking the Non-E bracket win without so much as moving an inch. With the Renegade done, we move on to Sunday with all the Import Outlaws racers, where cars from around the world gather together for some Heads Up racing! There's a number of different brackets in play here, the All Motor, Street, Motorcycles, and Turbo brackets, as well as a Round Robin event that'd lead to the winner competing for the Top 10 Ladder later. Alongside all these brackets was anybody and everybody who wanted to make a few runs down the track without partaking in competition: The Test and Tune racers. The Round Robin ended up between Reyes Valdes and Jose Garcept. Off the line, it was clearly Reyes who had the upper hand, his 107 MPH 95 Honda leaving Jose's 96 Acura in the dust, finishing nearly a full second ahead with a 7.115 E/T and with a full 20 MPH advantage on the speedometer. In the Import Street class, Andrew Bennett brought his 16 Camaro to the line p against Ryan LaBranche's 13 Evo. The lights dropped and Andrew was off the line first with a .267 R/T, getting a good lead over Ryan's .480 R/T. 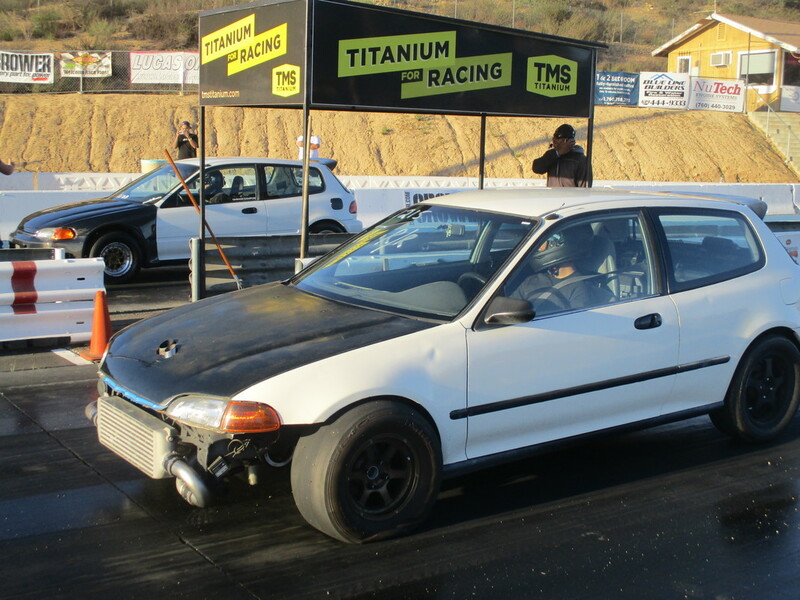 Andrew pushed that with his slightly faster car to a 7.570 E/T, beating Ryan and getting the Import Street Win. When the Motorcycles lined up, everyone knew the fastest and most dangerous vehicles were ready to put on a shop. 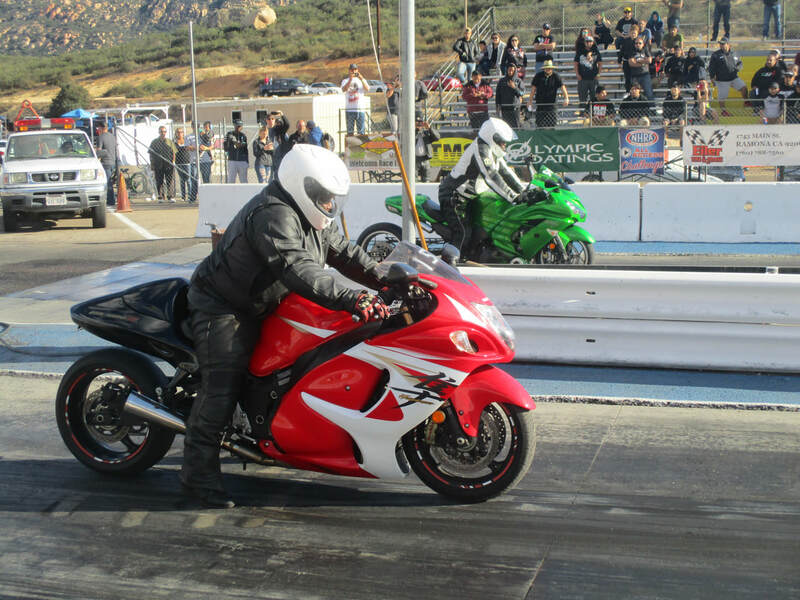 And the final between Ken Henderson's 12 Kawasaki and Vince Hill's 14 Busa was no exception. 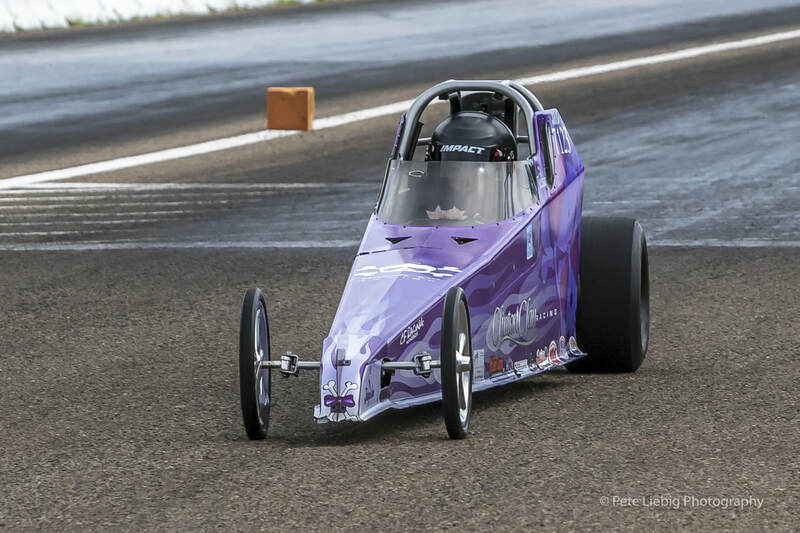 Both racers had enough power in their rockets to break 110 MPH, and when they both fired off the line with nearly matching .180 and .182 reaction times, you know it was going to be a close race to the finish. 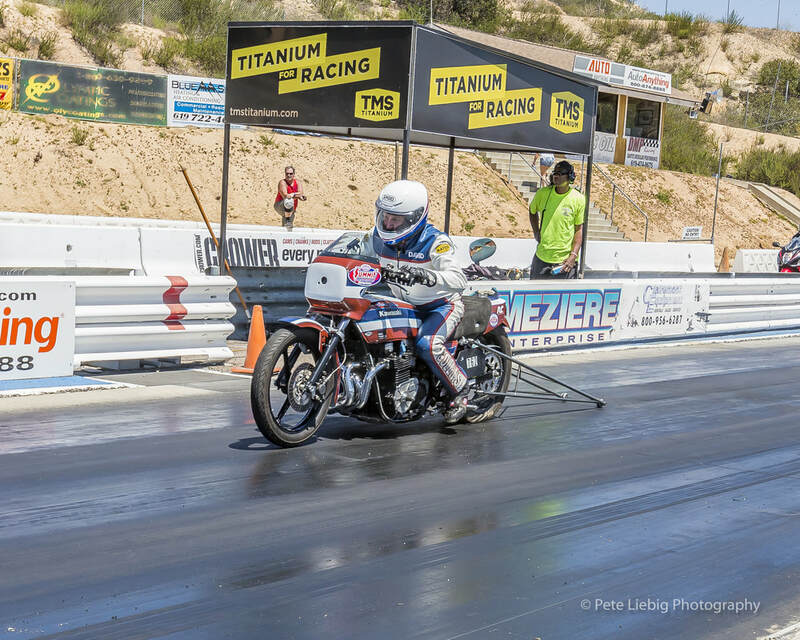 Ken pulled ahead in the end with a 5.944 E/T, while Vince Hill lagged just behind with a 6.237, getting Ken Henderson the Import Motorcycles win. 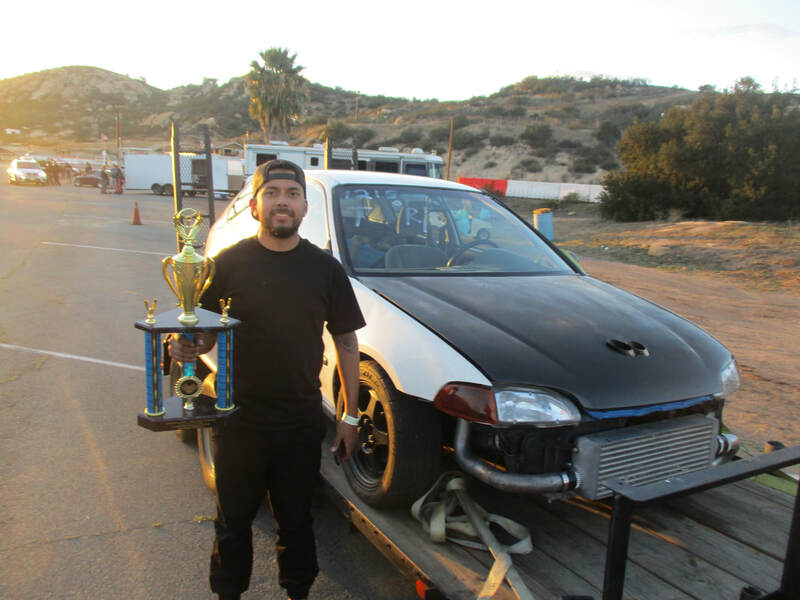 In the Import Turbo bracket, Omar Campos and his 92 Civic was feeling pretty good about their odds up against Reyes Caldes and his 95 Honda. Omar got off the line first, too, with a .163 R/T compared to Reyes' .226. However, with a pop from the engine and a surprise veer to the right wall, Omar's Civic couldn't finish the race, giving Reyes the Import Turbo win, to go with his Round Robin victory. 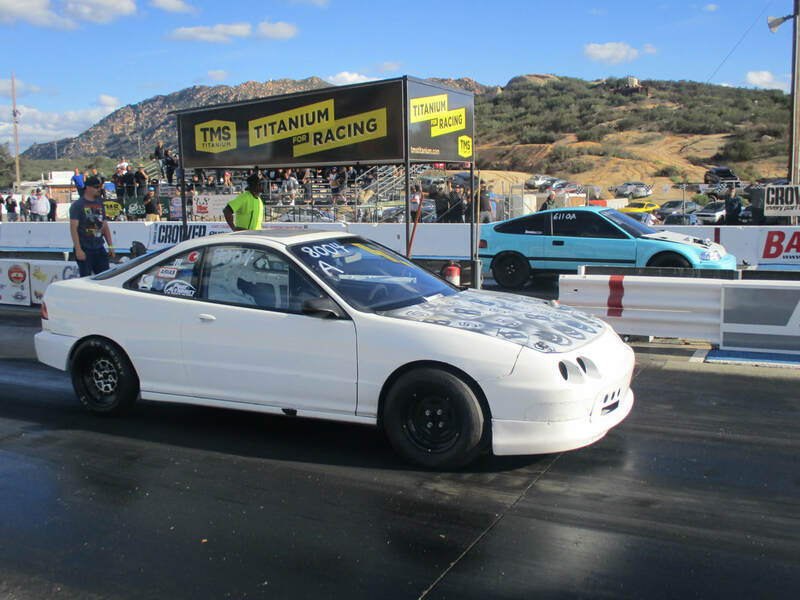 And finally, in the Import All Motor bracket, Eric Lopez and his 98 CRX was up against Tristan Workman's 95 Integra. Eric got off the line first, and road that head start to a 7.154 E/T, beating Tristian's 7.427 E/T, getting the Import All Motor win and wrapping up a fast day of Import Racing. Eric Lopez (Far)in the Import All Motor Final against Tristan Workman (Near)Now with another fast weekend of racing behind us, it's time to look forward to March. With Spring around the corner, the Renegade returns with another spring in it's step. Saturday March 3rd, the Renegade returns, with open Test and Tune to anyone wanting to bring their cars down. Gates open at 10AM, and racing continues until 4. See you there! It's the start of a new season at Barona 1/8th Mile Dragstrip, but there was still some leftover clean up from last year. 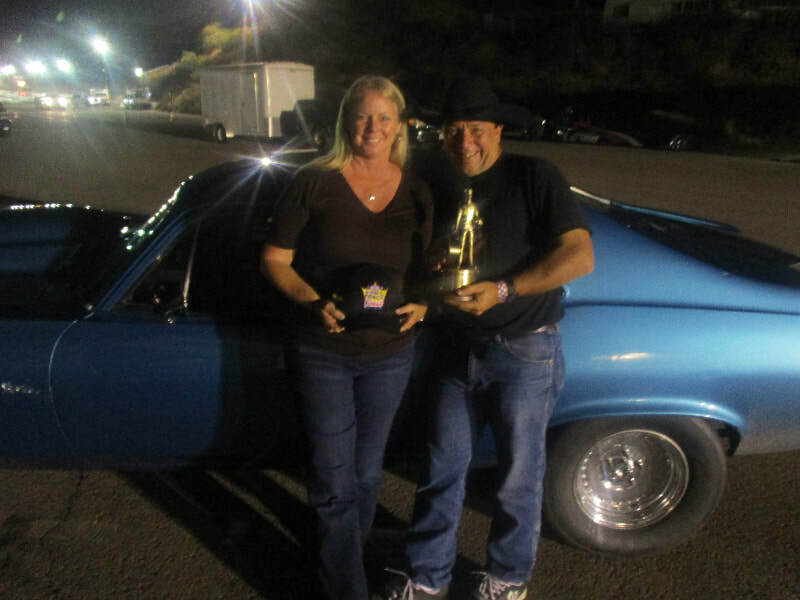 When one of the Renegade races was rained out, so was the 2017 Member Track Madness, leaving us one championship, trophy, and tickets to Pamona for the NHRA Winternationals to give out. The way it works is simple. The Renegade Electronics and Renegade Non-E are ran as normal. Once we have winners in both brackets, they run one last race against each other, and the winner gets to be the Member Track Madness champion, and get to take home a big #1 trophy declaring them such. First, in the Renegade Electronics, Paul Wagner and his Valiant went up against Jeff Martin and his Datsun. Both cars were nearly even at the line, but Paul was a little jumpy; he launched 3 hundredths of a second early, disqualifying himself and giving Jeff the Renegade Electronics win. The other half would be found via the Renegade Non-E bracket, where John McKinney and Tracy Perez were matching up. Tracy's 70 Nova would launch first off a 7.60 dial, while John's 77 Camaro would be playing catch up with a 6.54 dial. He'd have to try and make up a 2 hundredths disadvantage too, as Tracy beat John on the line. 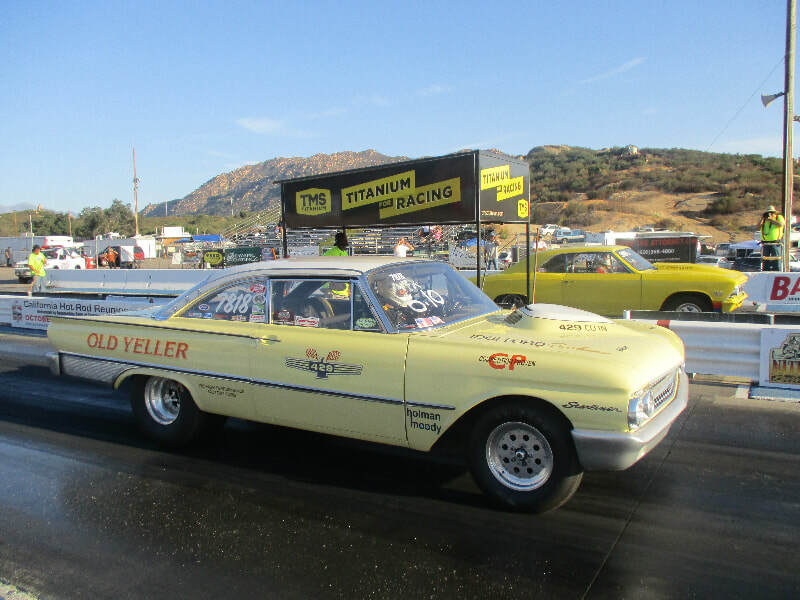 But, John's racing would come through, as he gets a 6.547 E/T on a 6.54 dial, making up that 2 hundredths lost at the line, and getting the Renegade Non-E win. With our Renegade Electronics and Non-E Champions decided, there was just one last race to decide who'd win the 2017 NHRA Member Track Madness Championship. This one was a heads up race, between John McKinney's 77 Camaro and Jeff Martin's 74 Datsun. 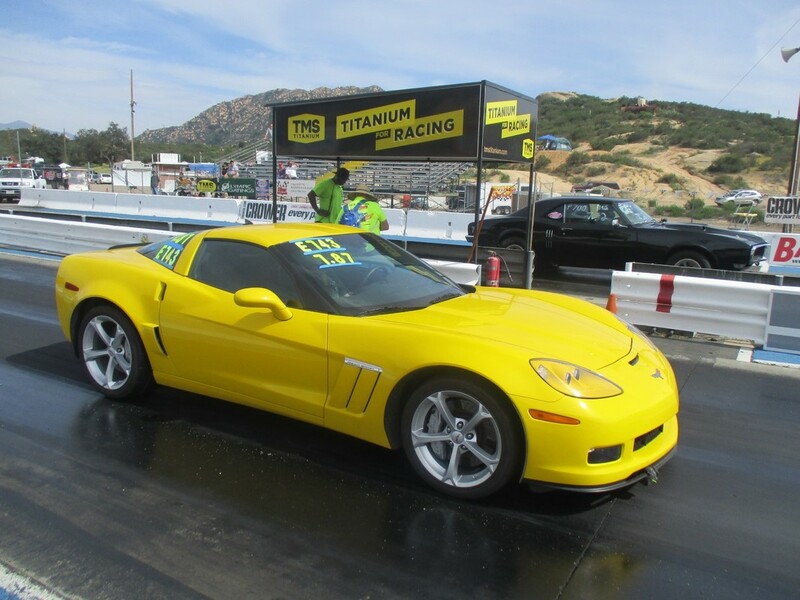 Again, John was slower off the line, as Jeff launched 15 thousandths of a second sooner, but John would pass Jeff on the track, and finish with a 6.537 E/T, beating Jeff's 6.717 by a more than comfortable amount. John McKinney (Far) against Jeff Martin (Near) in the Member Track Madness final. And with that, John McKinney wins the Member Track Madness Championship. And that was just the first Renegade of the season! In two weeks, on February 17th, the gates open at 10AM to start this again! Also, bring in your car for some Test and Tune trial runs, or try to get into the Gambler! See you there! John McKinney and his 77 Camaro, accepting the award for the NHRA Member Track Madness Championship.